Last night I persevered and stuck with my diet, watching everyone else eat pizza and cake at our older boys' end-of-season party and award ceremony (they both received the Varsity award!) for their high school hockey team, while I snacked on a bag of plantain chips... Tonight I finally took the time to try another new "pizza" recipe (from one of my new favorite cookbooks) for myself with all sorts of interesting toppings: arugula, figs, grapes and prosciutto. It turned out amazing!
. 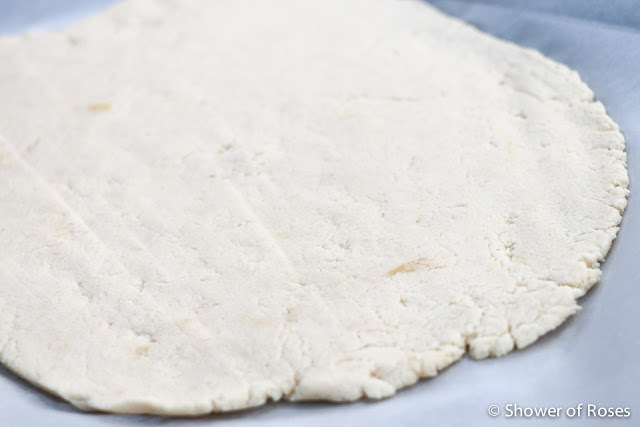 : Thin Pizza Crust :. Preheat the oven to 425˚F. 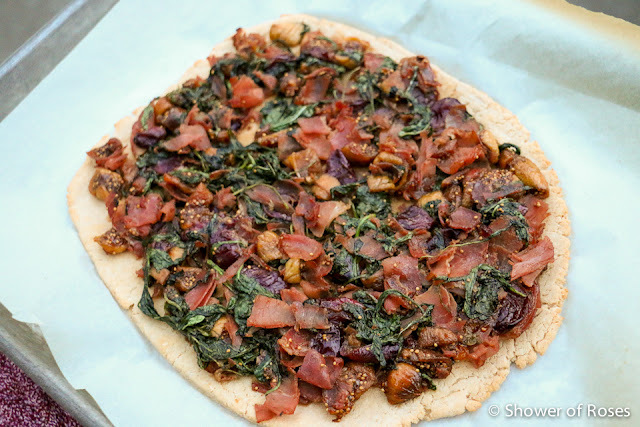 Line a cookie sheet or pizza pan with parchment paper. In a mixing bowl, whisk together the dry ingredients. Slowly pour in the olive oil, stirring continually as you pour. Mix in the warm water. Place the dough on the prepared cookie sheet or pizza pan. Lay another sheet of parchment paper on top of the dough and roll the dough into a 1/4 inch crust. Bake for 12 to 13 minutes, until light golden brown and crisp. 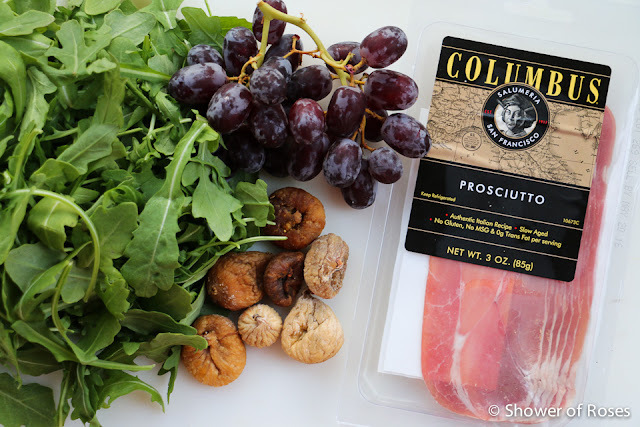 Use for a pizza recipe or cool, wrap in plastic wrap, and store in refrigerator for up to 24 hours or freezer for up to 3 months.
.: Prosciutto & Fig Bistro Pizza :. Heat the olive oil in a large skillet over medium-high heat. 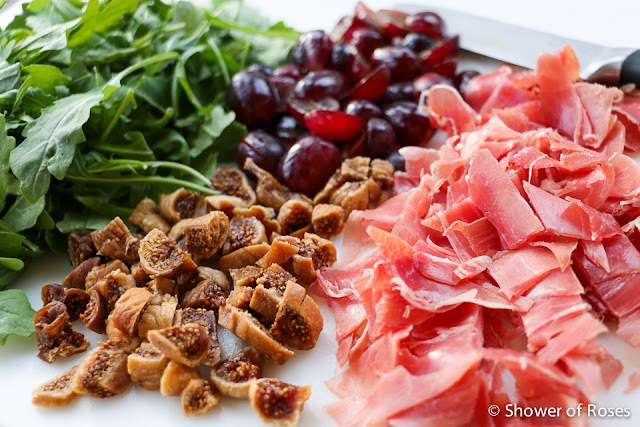 Add the chopped prosciutto, figs, and grapes to the pan and cook for 2 to 3 minutes, until the prosciutto is crispy. Add the arugula and stir continuously until completely wilted, about 2 minutes. 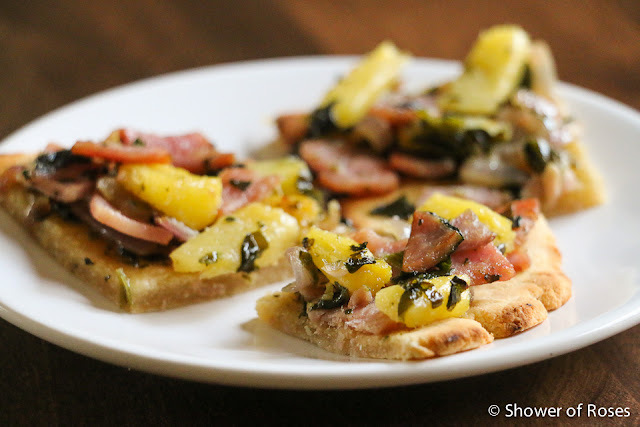 Top the pizza crust with the mixture and bake at 350 degrees for 5 to 7 minutes, until the top layer is golden and crispy.
.: Canadian Bacon & Pineapple Pizza :. 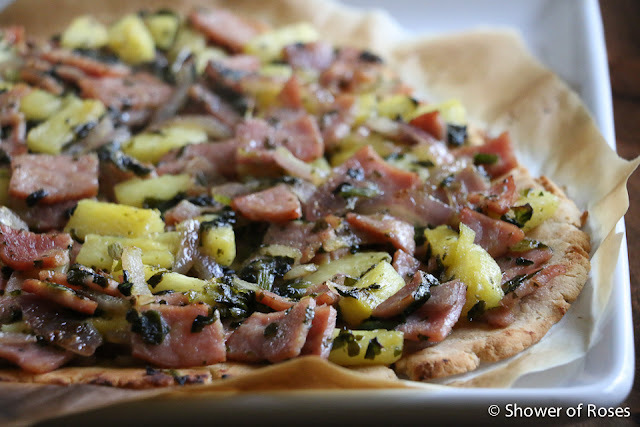 Last month I made the "ham & pineapple pizza" from The Healing Kitchen and have made it quite a few times since then as well. 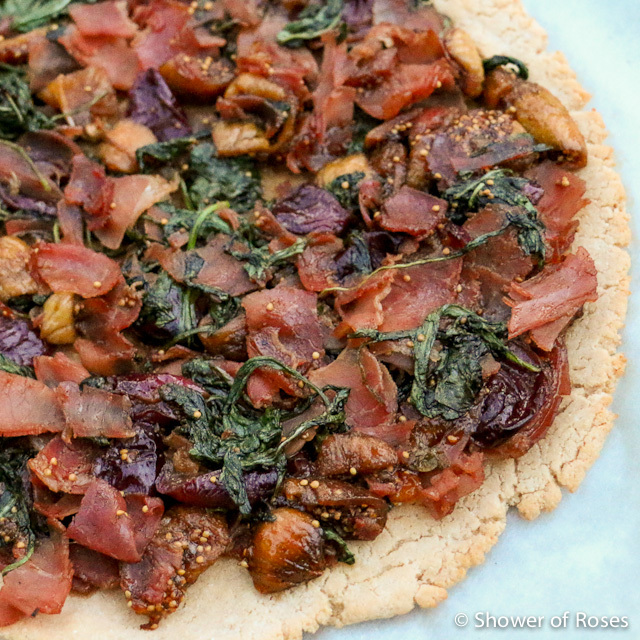 Perhaps it's because I hadn't had pizza, one of my old favorites, in nearly a year, but I love these recipes. They are so good! I've also made a garlic chicken pizza that turned out great too. Heat the olive oil over medium heat. Add the onions and garlic and sauté for a few minutes until softened and fragrant. 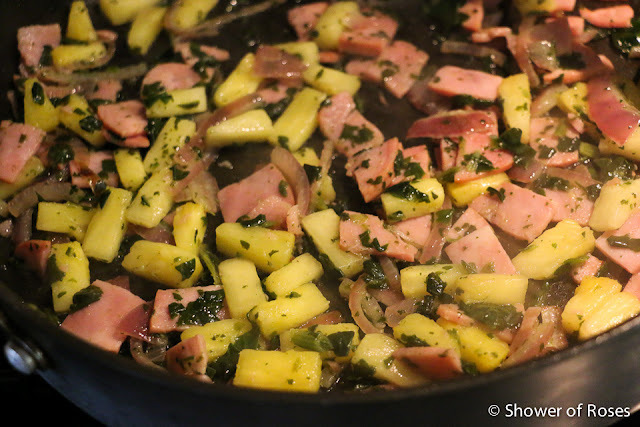 Add the remaining ingredients and cook for 2 to 3 more minutes, until the pineapple begins to release some of its juice. 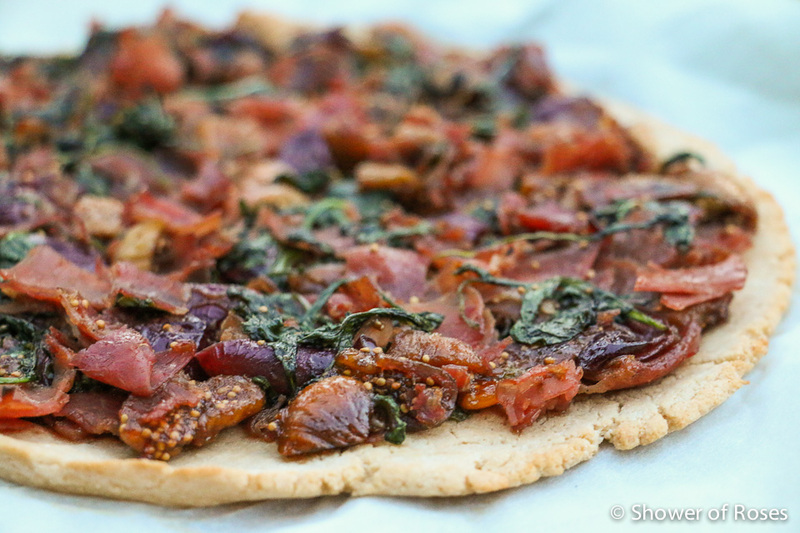 Spoon the topping onto the pizza crust using a slotted spoon, leaving as much juice in the pan as possible. 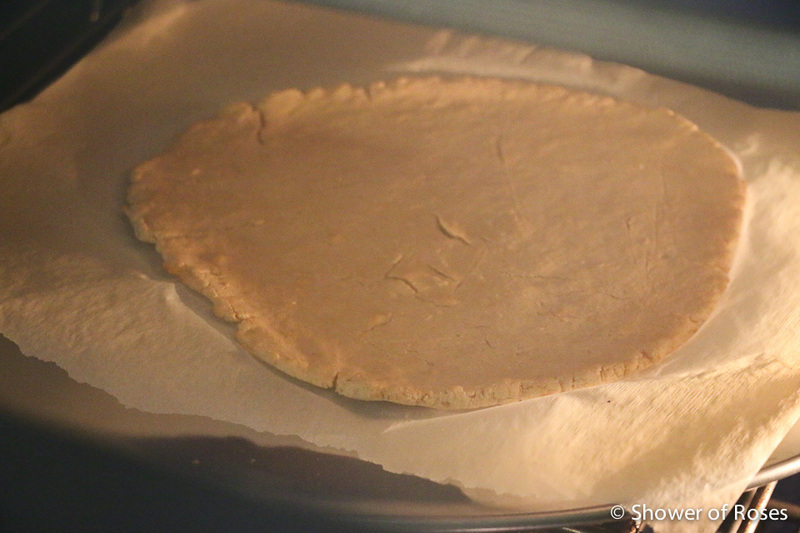 Lightly press the toppings down into the pre-baked pizza crust. 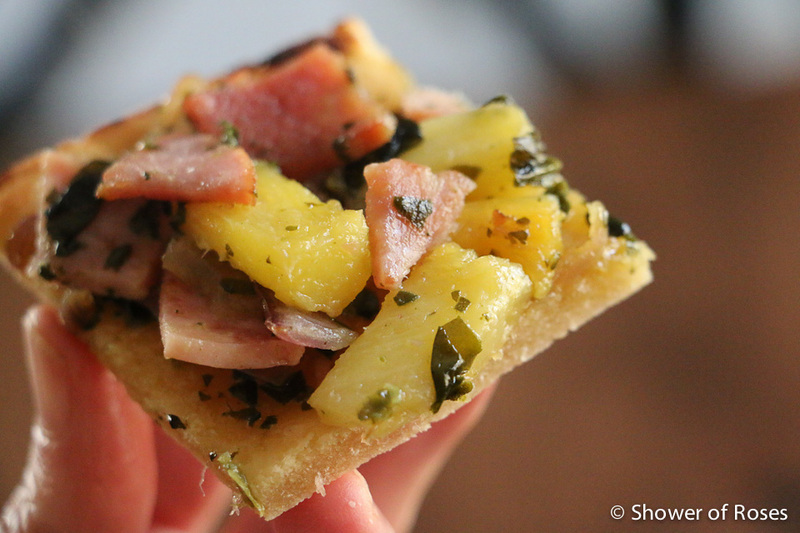 Broil for 3 to 4 minutes in the center of the oven, until the ham begins to turn golden brown with crisp edges. Let rest for a few minutes, then slice and serve immediately. Find the complete directions for baking these two pizzas, along with many more delicious recipes, in The Healing Kitchen: 175+ Quick & Easy Paleo Recipes to Help You Thrive.